The Oxblood Distortion was designed to emulate the tone and response of an old Vox AC15 with added gain at the input stage. Unlike other Vox-like pedals which emulate the tone and response of the Vox AC30, only the Oxblood Distortion emulates a boosted AC15. Unique to the Oxblood Distortion is it's ability to make a "large" amp sound "small" and in hyper-drive with the tone of the AC15. Also unique to the Oxblood Distortion is it's controlled output. While other distortion pedals use greater than unity gain at output to alter the user's amplifier input stages, the Oxblood Distortion does not. This keeps the true tone and response of the effect intact throughout the initial preamp stage of the amplifier in use. 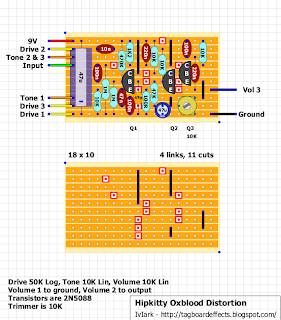 The schematic by WhiteKeyHole that I did this from (big thanks to him as usual for his great tracing) didn't include a supply filter cap, and so I did the layout above exactly as per the schematic. If you want to include one then you can use the following layout. I've used an axial cap because I have those to hand in that size, but you could use a radial cap if that's what you have available, and you could probably reduce the layout in width by a column if you do. 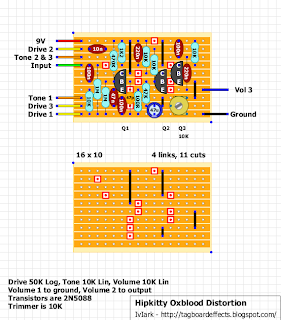 A couple of notes based on the FSB thread, if you want more volume then you could reduce the value of the 10K resistor at Q3 collector, for more bite reduce the 220n in the middle between row 1 and 4. Maybe socket and experiment to fine tune it to your liking. Hi mate... What is the purpose of an filter cap? is it a possible noise reduction? Yes noise reduction. But after the cap preventing some of the oscillation in the Hyperion 2 in the thread the other day, I've decided that if the schematic doesn't have one, then I'm not going to include one. Or like in this instance, I'll include an alternative layout with one included. What is the trimmer for? Biasing the transistor? Yes. The scheme is similar to a Tone Bender or a buffer into a Fuzz Face. And so it's like the bias pot that some people like in a Fuzz Face on Q2. Very sweet tone from this... I would strongly advise to ditch the 10k resistor for a 2k2 to the top,far right. The 10k gives a volume below unity. A 4k7 gives a small volume boost but a 2k2 gives a significant volume boost. To add, I added the input filter just in case. 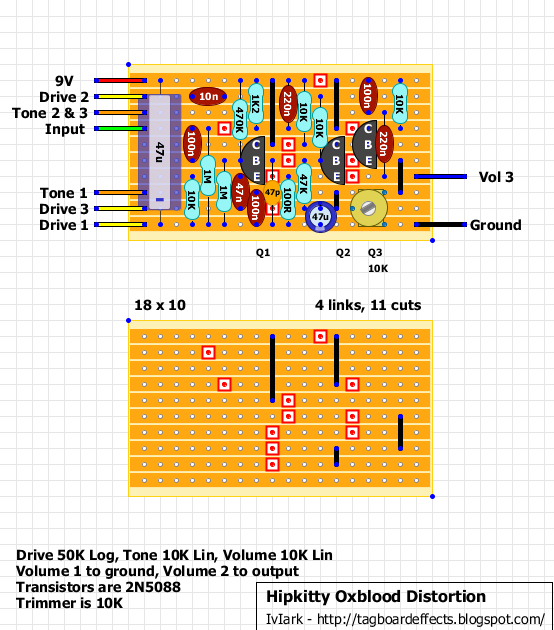 Hi mate, Would there be a bass increase mod anywhere here? and also where would I feed the wires to make the trim external? How can I get this thing to stop oscillating? I love the sound, but if I turn up the drive or lower the tone, I get a nasty squeal. Any ideas? I realize this is an older post but I just wanted to say thanks for the blog and all the great info provided here. I have owned a oxblood since 2009 but it has migrated off my pedal board in the last few years. I loved the tone but the lack of volume just made it impractical for live band situations. I have kept it this whole time for recording purposes but I was thinking of putting it up on ebay until I read the above post. 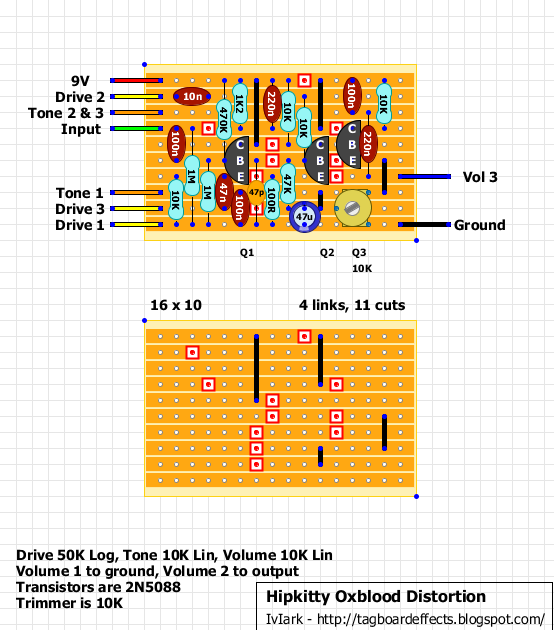 I just swapped out the 10k volume resistor with a 2k2 as per vince above and what a difference. Tons of volume now and I feel like I can work the tone a little better with my volume knob as well. I did have to adjust the trimmer because it was pretty buzzy with the original position but I feel like I have a brand new toy for .10 cents and some solder. Thanks again. I tried the 2k2 resistor. Too spuddery for my likes. I went with a 5k1, then a 8k2 and finally settled on a 9k1. This put me as close to the original 10k resistor, kept the tone near what it ought to be, gave me plenty of boost and removed the spudder. Nice build and tone for a strat! Built this one. Pretty cool sounding OD. I'm using a 2K7 because that's what I had at hand. Initially I got a sputtery sound too, but that was only until I adjusted the trimpot to about half-way. A lot of volume here! I think I'm boxing this one. Ok, reporting back. This isn't a noisy circuit considering the amount of gain you can get and I'm not getting any RF after boxing it in a proper pedal enclosure. The "boxy" sound is certainly due to the slight "cocked wah" EQ it has, which trim your lows and bump the midrange, making it really sing. Sounds much better as a "lead tone pedal" than a "rhythm pedal". The tone control on mine doesn't do much after noon. Anyone else experiencing the same? hello, a question I made this pedal, it sounds and everything goes but there is something wrong ...... only sound of distortion is heard when I hit the strings very hard but it does not sound and it sounds broken. check everything but I can not find the problem, any ideas?